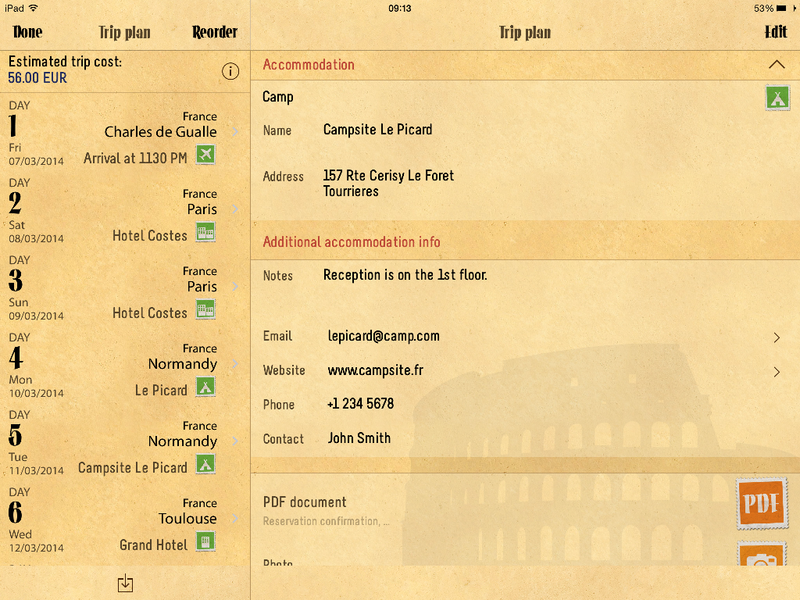 TripRider is a travel app available for iPhone and iPad devices, although the Android version will launch soon as well. The company which programmed the application comes from Slovenia and they were kind enough to offer 7 free copies of the app for you! There’s a free and a paid version of the application. You can download the free one here. It also has all features as the paid one but it’s limited to 3 trips, 3 days trip duration, 3 maps etc. TripRider helps the traveler to organize, manage and share their trip and it consists of 15 modules. The most interesting ones I’ll present in my TripRider App review below. Application allows you to enter the duration of your trip with many additional options and you can also plan each day in detail. As you can see above, there’s a very handy accommodation section which I think is great as you can add the address of your accommodation along with email, website and phone. I have usually saved that on my phone or I carried papers with maps and directions, so it’s great to see that there’s an app which actually allows you to have everything in one place. And the best of all, you can use it offline too so there’s no need to chase wifi! With a quick search on Google you can find various packing lists including the one of Rick Steves. I’ve been using his list for quite some time, but again it’s great to see that a packing list has been incorporated into a travel app. 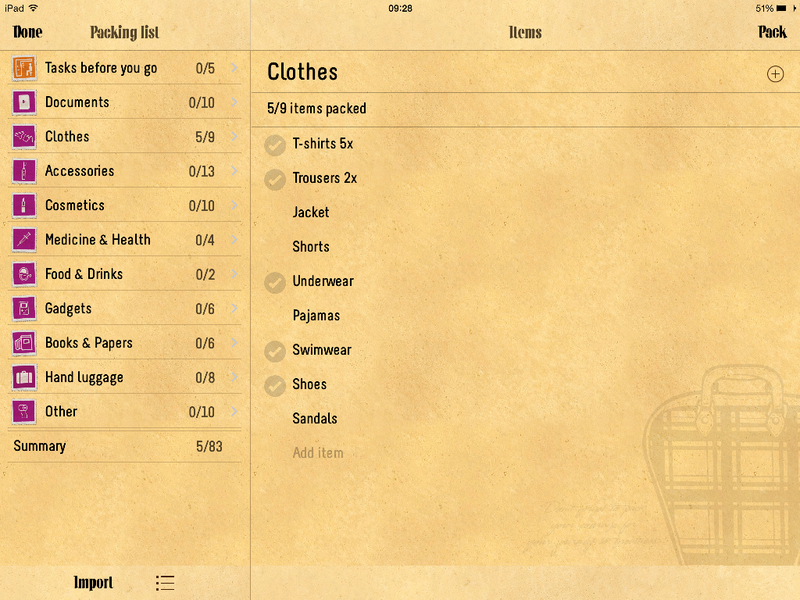 The packing list is broken down by categories and you can also fill the “tasks before you go” section. You can store copies of your tickets, credit cards or anything else. Wallet is password protected and all sensitive data is encrypted. You can add photos of the maps that you’ll need during your journey and use them even offline. As mentioned earlier I usually printed the maps but when you get to your final destination, looking for this piece of paper in your backpack can turn into a hassle. Why bother if you can do everything with your device? 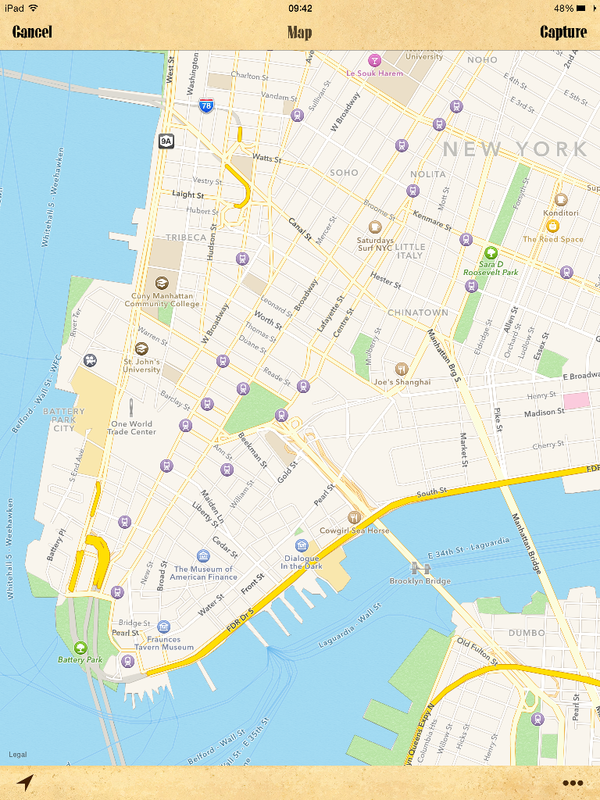 If you own a guide you probably won’t need to use this feature that often, but it still comes handy if you’ll want to save recommendations from friends and other travelers on less-known tourist spots. 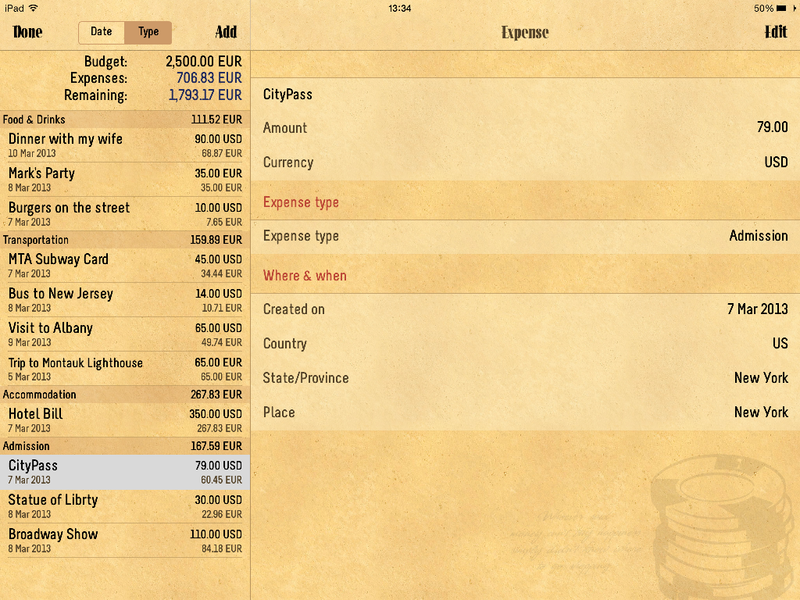 This feature allows you to see a quick overview of your trip such as planned events for the day, budget and expenses etc. You can track all of your trip expenses so you can keep your budget under control. 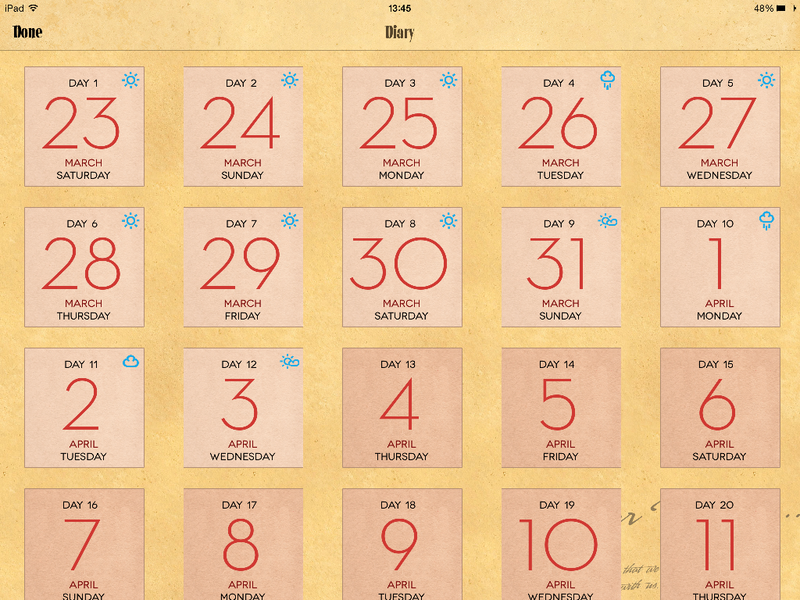 This is a great feature as it can help with future trip planning as well. Diary allows you to document each day of your trip in text or photos, making this feature not only great for travelers but for us travel bloggers too. You can see all of your photos here, but you also have the option to export them to “photos” application. You can even add your friends if you travel in a group or the people you met during your journey. This is for example really handy if you meet great people in a hostel or at a CouchSurfing meeting and you want to add their names and contacts. When you’re back home you can create your own trip book in a PDF document that you can store, print or share with your friends. I think this is one of the best travel apps on the market and it’s a great value for money. It incorporates many useful features in one app which is why I think it’s so loved by travelers. Its retro design is also very interesting as it’s a nice contrast with Apple devices. If you are unsure you can always try the free version first before upgrading. The only drawback is that this application is still not available for Android and Windows Phone but the good news is that developers at TripRider are already working on Android version. Again I’d like to thank guys behind TripRider who were kind enough to offer 7 free copies of the app. The contest will end on January 17th and the winners we’ll be picked randomly and notified by email. This looks like a very useful app. I’d love to visit New Zealand! I am heading soon to Hungary where I lived for the past year. Would be great to have this app. Thanks for the review.